A traditional village named Bena has been one of the mandatory when you visited the island of Flores, East Nusa Tenggara (NTT). Here, time seems to stop when the life of the stone age you can still enjoy and absorb with an impressive hospitality of the people with a smile on your mouth is red from chewing betel nut. Enjoy the luxury and splendor of one of the magnificent Nusantara cultural heritage in Bena. Perched on a mountain with berporoskan Inerie (2245 masl), the village of Bena in Bajawa is one of the traditional village of Flores of the remaining leaves traces the remarkable megalith culture. 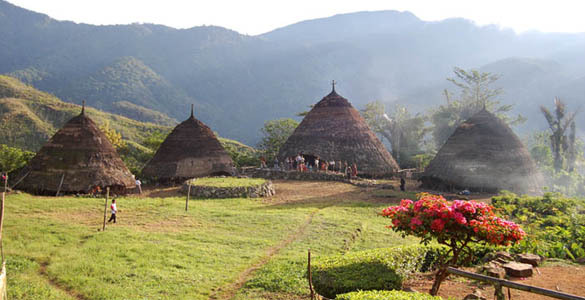 The village is located only 18 km from the town of Bajawa on Flores Island. Bajawa city located in the basin as a plate lined with mountain ranges. The city is visited by many tourists especially the weather is cold, cool, and rolling hills, much like in Kaliurang, Yogyakarta. Life in the village of Bena is maintained with a stone age culture that has not changed much since 1,200 years ago. Here there are nine tribes who inhabit the 45 units of housing, namely: the tribe dizi, dizi Azi tribe, the tribe Wahto, tribal Lalulewa roar, roar Solamae tribe, the tribe Ngada, Khopa tribes, and tribal Ago. Distinguishing between one tribe to another tribe is the fruit as much as 9 degrees. Every single tribe in the same height level. Bena tribe house itself is in the middle. Because interest rates Bena considered the oldest and founder of the village because it is also called by the name of Bena. Generally, citizens of the tribes of Bena livelihood as cultivators with verdant gardens growing on the sides of the canyon that surrounds the village. To communicate their everyday use of language Nga'dha. Nearly all citizens of the village of Bena embraced Catholicism while still running the trust, including customs and ancestral traditions. Currently 326 people inhabited the village of Bena in 120 families. However, the traditional ties of this village, more broadly because there are thousands of other people who are descendants of Bena residents living outside the village custom. Bena villagers to follow the system of kinship with his maternal lineage. Bena man who married a woman of another tribe, it will be a part of her clan. Bena specifically for women in their weaving skills required to have a motivated horse and elephant as his trademark. For the citizens of Bena, they believe that God dwells atop Mount Inerie Zeta is protecting them. Inerie mountain is as high as 2245 meters above sea level the mountain with a thick forest to the west only. Meanwhile, on the slopes of the southern part of the plantation. For the citizens of Mount Bena Inerie considered as a right mama (mother) and Mount Surulaki be claimed as the father (Father). Adventurers and climbers flock to Mount Inerie during the dry season (between June and August). From the summit looks beautiful views from all directions including Bajawa city in the northwest. In the southern part of the visible blue pressed Savu Sea at the foot of this mountain. 1882 and 1970 eruption of Mount Inerie ever and is now leaving a trail of beauty and splendor with fertile soil in sekilingnya seasoning. Notice how the size of bamboo grow quite large in the vicinity of this mountain! Here you can satisfy to observe berhamparan megalith stones arranged for ceremonies with spectacular formations. Discover the luxury and grandeur of the stone age culture was shown. Bena residents since the first thought that the mountains, rocks, and animals should be respected as part of life. When you set foot on the front porch of the village of Bena then presented views of palm fiber roofs of traditional houses lined look berumpak-pedestals. Body extends from the village north to south with the entrance of the village just north. At the other end at the southern edge of the cliff is a steep peak at the same time. Bena village has a length of 375 meters and 80 meters wide. At least there are more than 45 homes that surround this village accompanied by the authenticity of megalith culture. Note 9 level elevation of land in this village at once distinguishes nine tribes who inhabit it, and each of the tribes are in a certain height level. The nuclear family home boy named sakalobo, a statue of him in the house that holds the sword and spear. Meanwhile, the nuclear family home called sakapu'u women. You will also see a lot of buffalo horns, pig jaws and fangs hanging on display in front of the house lined up as a symbol of social status of Bena. Horns, jaw, and pig tusks are from animals sacrificed by each tribe as traditional ceremonies. Ngadhu standing in front of each custom home building which has become a symbol of male ancestors. Ngadhu umbrella is home to a carved wooden pole, the root timber must be forked, and planted with pork or chicken blood. Ngadhu the palm fiber roof has a single pole of a special kind of wood is hard because it also serves as the scaffold when the ritual animal sacrifices. As well ngadhu standing in front of the home page custom Flores, bagha is a symbol of female ancestors. Bhaga form of miniature custom home that is prepared to accept a man who marries a woman in this village. Each is marked with a fine custom homes (weti) and on the roof there is a useful weapon to protect its inhabitants from evil spirits. Miniature bhaga also has significance as a motivation to live for their children and as a reminder that wherever they go then it must be remembered that this village is the place of origin. Because there are nine tribes in the village of Bena then there are nine pairs of ngadu and bagha. On the top right edge of the highest end of the village of Bena people would not think there is a place that serves amazing panorama. From the top of this hill to bridge the gap mengaga series of mountains and the Savu Sea to the right. Make sure you take pictures with an incredible background. Young betel nut chewing and camphor are combined daily habits inherited from their ancestors. Chewing this concoction will give a fresh taste with a bonus red in tooth trace. Chewing betel nut is not about time, these activities can be done morning, afternoon, evening and even night. A mixture of betel leaf, areca nut, lime, gambier and a bit of spit tobacco produces residuals that are red and the remnants of the betel-nut fiber. It was not sweet, but the experience can be incised to taste the sweetest experience when you visit the village of Bena. Pecan (Aleuritis molucana) are dried in the sun is a sight that will surely be found in Bena. Bena village residents cultivate hazelnut seeds that contain mild toxins by heating without oil or water until the seeds warm. Natural warming by leaving it in the hot sun will elaborate the toxin. Hazelnut seeds used as a source of oil and spices and oils that are extracted from the seeds can be used as an ingredient of paint. You can rent a vehicle to get around in Bajawa. Bena village location approximately only 18 km from the town of Bajawa. View over the village of Bena enriched spots beautiful scenery. Do not hesitate to ask the driver to tell the good angles to capture the beauty of nature with your camera. Kampung Bena, or Bena Village is one megalith villages in Indonesia. It located in Tiwuriwu village, Aimere sub district, Ngada regency, East Nusa Tenggara. This village is settled in uphill with the view of Mount Inerie. The location at below of the mountains are the hallmark of the old cult of mountain as the place of the gods. According to the local inhabitant, they believe in the existence of Yeta, the god who settled in the mountain who protect them and their village. This village currently comprises about 40 houses that surround each other. Village grew elongated body, from north to south. The entrance to the village just to the north. While the other end in the south has a top edge of the cliff at the same time. In the midst of the village there are some buildings that they call bhaga and ngadhu. Bhaga building looks like a small cottage (without occupants). While ngadhu of colonnaded buildings and single-fiber-roofed thatched cottage, which looks similar to the shade. Ngadhu is an usual pole of a special type of hard wooden material, because they serve as the scaffold when there is sacrificial animals traditional party. The inhabitants of Bena are belong to the tribe of Bajawa. The majority of Bena are adherents of the Catholic religion. Generally, Bena people are live as farmers, but for women, they also doing weaving. At the beginning, there was only one clan in the village, which was Bena Clan. Because there were marriage across clans, then made some new clans that born to be the whole village nowadays in Bena. Bena people is having matriarchal system their kinship. This village has not been attach to any kind technological advances. The architecture of the building is very simple, with only one gate for entry and exit, according to government of Ngada, Bena Village is estimated to have existed since 1,200 years ago. Up to now, the pattern of life and the culture of the people has not changed much. Where the people are still hold fast to traditions that passed down by their ancestors. This cultural site were registered as one of the world heritages in UNESCO in 1995, but it has been visited by many foreigners that come to East Nusa Tenggara. The humble heart of the indigenous people will sincerely welcome the visitors that coming to their village.